I was asked recently this question from a visitor, that I though someone else might empathize with, or provide insight. Is it necessary to consume alcohol onboard the ship? I heard that some crew members will force me to drink, but I don’t have a habit of consuming alcohol. I think what you are asking me, is whether you are required to drink while working onboard a ship. The short answer is, absolutely not. Drinking onboard has long been an activity associated with seafaring, and some regard it as tradition. However drinking, and other substance abuse, is becoming more and more rare, due to the “shore people” insistence of “zero tolerance policies”, which means no alcohol or drugs allowed onboard. These policies are not for our health, but more because shore people “can” require this, and it makes them seem like responsible people in the eyes of their insurers. I personally like a drink when onboard, but I don’t see a need to get to the bottom of the bottle, but very few ships I work on allows it. There is an argument to be made about camaraderie on-board, when able to socialize, usually around a drink; this can build very important team cohesion. Alcohol is a good “social lubricant”, able to break down some barriers; but now with zero tolerance, crew members retreat to their laptops and isolate themselves in their cabins. I believe this creates it’s own set of problems. I think that people with substance abuse issues, will continue to have substance abuse issues, no matter what the company says. However, one must keep in mind that onboard conditions – loneliness, isolation, easy access to alcohol, historical norms. etc, means that substance abuse such as alcohol, are a particular risk factor for seagoing personnel and therefore should be managed. Instead of just saying “no tolerance”, a good company and leadership will provide alternatives, such as proper facilities to socialize and mitigate the risks of loneliness and isolation. In your case, as a professional seafarer on a commercial ship, there is no reason you need to drink, or especially, should be forced to drink. Some people will “cajole” you, but these people are probably longing for camaraderie; those that “force you” have more serious issues, either with their own substance abuse, or worst, dominance issues – bullies or other predator. Either way, you don’t have to drink onboard. 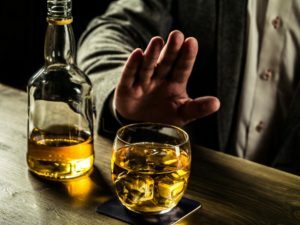 You can insist that you are not interested, or you can use other tactics; like make you own “drink”, with no alcohol – you can still participate in the social event without drinking alcohol. You can also state that it makes you sick, some people are allergic to alcohol, this is fairly common, I don’t know too many people that would question that. Peer pressure is always strong, so stand your ground, and if you want to drink, its okay to set limits, you don’t have to drink until you are sick. The important thing is to state clearly your desires – at least to yourself – and stick with it. Anyone that forces you to drink or do things that are knowingly outside your comfort zones, raises a red flag, as people to be avoided and closely monitored. Ideally these people should be reported to someone you trust, in hopes that they can be weeded off the ship, and the company. Hope that helps. Here are some relevant tips, aimed for a younger crowd, but could be of use in similar situations.